Tony Green was born in Naples, Italy in 1954. His family soon moved to the United States, settling in Louisiana on New Orleans' West Bank where Green spent his childhood. Green began his studies in Washington, D.C. at the Corcoran School of Art. For the next few years, he continued to travel and study all over the world, leaving his home in New Orleans and planting the seeds of his gypsy lifestyle. 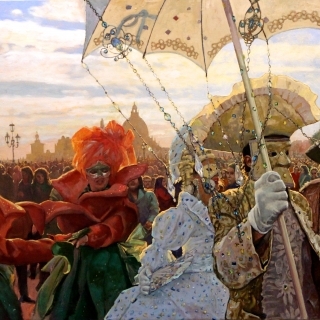 In 1982 Green returned to his native Italy to paint, establishing an annual tradition that has continued up until today. Green spends each summer in the city of Venice, capturing on canvas the romance of the city, its people and its historic canals. The artist also has absorbed, through his European travels, a great appreciation of past masters. His chief sources of artistic inspiration are DiegoVelasquez (1599-1660), John Singer Sargent (1856-1925) and the Spanish painter Joaquín Sorolla (1863-1923). As Tony Green specializes in the street scene genre, it is no wonder he has decided to split his time between two of the world’s most interesting and beautiful cities: New Orleans and Venice. His cityscapes are expressive yet precise in their execution. Green often paints unusual views of his favorite cities, exploring the nooks and crannies of their unique architectural detailing. For this reason Green likes to paint en plein aire, a method that facilitates his bold use of color, playfulness of light, and of course, his depiction of unique views of the cities in which he works. New Orleans residents know Green's work from the various murals around town, including the Storyville Music Hall triptych that now finds its home in the Louisiana State Museum's Jazz Collection, a jazz mural at Harrah’s Casino and the equally well-known Mid-City Bowling Lanes mural of 1950's life. Most recently, Green was praised for his 120-foot-long mural painted for the walls of Isidore Newman School to celebrate its 100th anniversary. The mural itself is a commemoration of the rich history of Newman, including scenes of past theatre productions, music concerts and athletic victories, meant to inspire a positive and interesting future. The mural itself was composed of scenes taken from black and white photos from Newman’s archives. Green’s images will doubtlessly motivate budding artists for years to come. Greens murals truly have filled the city of New Orleans with color and character; his work can be seen in restaurants, casinos, hotel lobbies and music halls. Green has mastered several artistic mediums; he paints in watercolors, acrylics, and oils, and also expresses his mastery of line through etchings. The self-proclaimed, “gypsy jazzman” is truly a son of New Orleans’s music and spirit. Baber, Bonnie, “Bohemia Central” (pp.51-53) At Home in New Orleans, May 2006.